SPDIF-9PIN from Focusrite is a breakout cable for the optional 24-bit/96kHz AES/SPDIF/ADAT interface card available for the OctoPre. 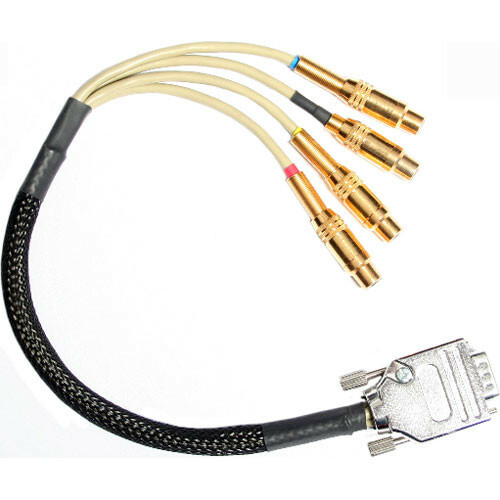 The cable is specific to outputting S/PDIF digital audio from the card (AES/EBU output requires a different cable) and comprises a 9-pin D-type connector, terminating in four male RCA coaxial connectors. Box Dimensions (LxWxH) 9.2 x 6.0 x 0.3"
SPDIF-9PIN OctoPre S/PDIF Cable Assembly is rated 4.0 out of 5 by 1. Rated 4 out of 5 by Anonymous from octopre spidif-9pin I baught the octopre s/sdif cable to use with my isa one and loved the improvement it gave it. Only problem is that sometimes the cable wont work and ill have to turn off and on the isa one till it works. But afterall I loved the quality of the cable when using a high quality spidif cable with it.